The Maxwell area got its name from Dr. Lummis a long time ago in honor of the family name of his wife. The following photos and information look back at the Maxwell Creek Cobblestone House as of 1952 and are courtesy of Richard Palmer. On the Old Preston Farm about two miles west of Sodus Point along the Lake Road, is one of the finest cobblestone houses in the area. Built without benefit of architect in 1845, the house has four levels and conforms to the slope of the terrain so closely that it gives the impression of having grown out of the soil. It stands on a rise of ground like a sentinel scanning the horizon at the spot where a stream widening into a bay joins the waters of Lake Ontario. It has stood thus for more than 100 years, with its solid front door and wide flanking windows facing the oldest road in the township, which runs across the edge of the sloping front lawn and then dips downhill to cross the stream flowing at the side of the house. 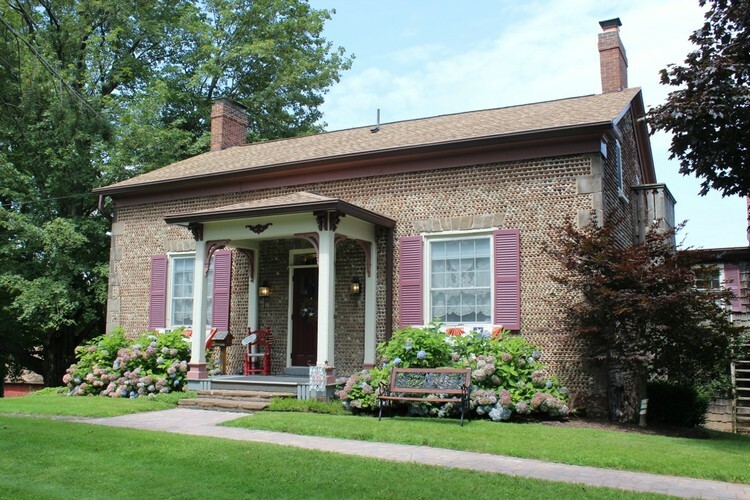 One under and seven years ago William Swales bought this land and built the present cobblestone house for his daughter, Elizabeth, who 10 years before had married John Preston Sr. The house which Swales built, with its smoothly rounded, uniform lake stones marching in straight rows back and forth across its walls from foundation to roof line, has been known simply as the Preston house from the beginning. The stream between is designated Salmon Creek on the maps, but no such name has ever been used in Sodus. It, too, has ben Preston’s Creek now for more than a century. 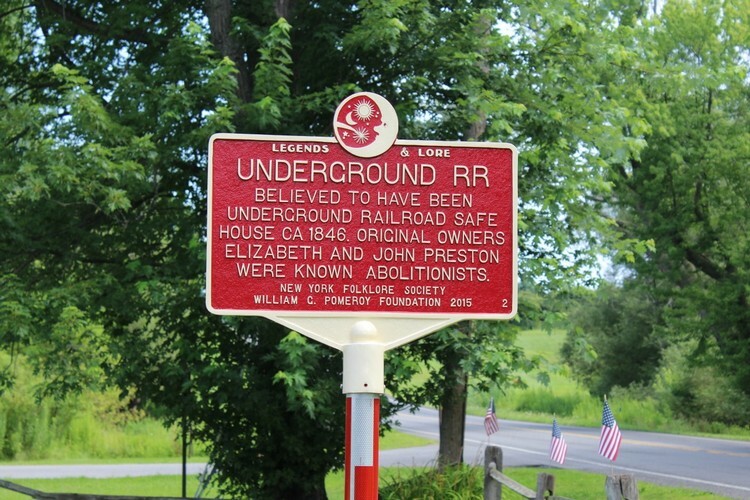 With the exception of about 26 years, the Preston farm and its cobblestone house have been owned by descendants of the first John Preston who came from England in 1831. Today it is back in the same family again…owned this time by Preston Arms Gaylord Jr., the great-great-grandson of the builder of the house. The present owner, better known as Buddy Gaylord and his wife, Mary Ellen, who i is the daughter of F. Ritter Shumway of 375 Ambassador Drive in Brighton, purchased the Preston farm this spring. Almost immediately the young couple set about the gigantic task of restoring a century old house, lived in and altered more or less by four or five generations of Prestons and as many other families. Entering the heavy front door with its wrought iron latch and knocker, the visitor finds himself in a wide central hall. At the far end of the hall are two stairways … one leading down to the big dining room and kitchen on the ground level and the other rising a few steps to the bedrooms in the back wing of the house, before turning to rise to the second floor above the main part of the house. Opening off the front hall to the right is a long living room with twin fireplaces and deep windows, whose casings are unusual in that they slant or flare outward at about a 30 degree angle to join the interior walls of the room. The window panes, many of which are of “wavy” glass, came from England. As for the twin fireplaces, which the Gaylords have opened and restored, the two flues join part way up and form one chimney. This is the room in which succeeding generations of Prestons have held parties and dances. Down through the years however, this large room has been used for various purposes by different occupants. One owner used it for a combination riding room and kitchen, building a half partition or counter across the middle to separate the two areas. Across the hall from the living room is a smaller room, which the builder must have called the parlor. The Gaylords have opened the fireplace in this room and constructed book shelves about it. The wallpaper here is an early american design showing a repeat pattern of a Puritan girl, a hunter and his dog and a young lad playing a lute. Directly behind the parlor is what must have been a parlor bedroom, the Gaylords have made a pine paneled den. However, the fireplace in this room could not be opened for use since it is now in some way connected with the heating plant chimney. This is the only one of the fireplaces to be restored. Up a few steps aft the end of the front hall, to the next level are bedrooms furnished attractively with canopied beds, hand quilted coverlets and authentic old chairs. On the next level, which is the second story above the main part of the house, there are still more bedrooms. Here is the mast bedroom which has been decorated around the theme of the 115-year-old red and white hand-stitched quilt on the bed. 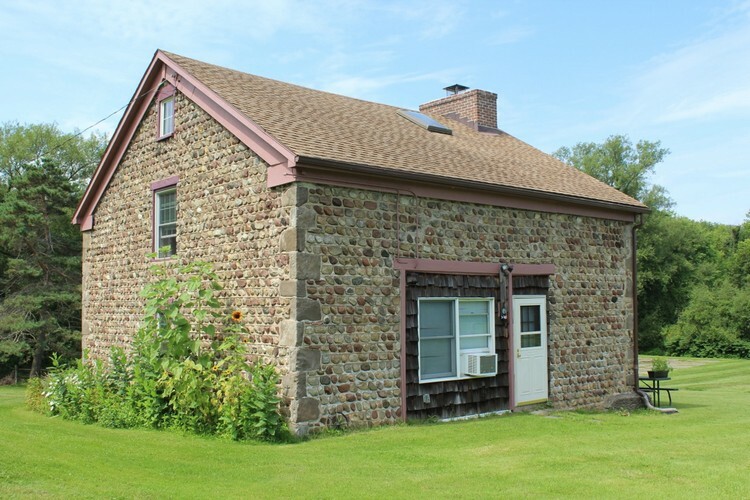 One of the most unique features is the ground floor level at the back which contains the old fashioned kitchen with its large fireplace and brick oven at the side, where that first Elizabeth Preston, (Buddy’s great-great-grandmother) baked coarse bread, pies and cookies. The large, sunny kitchen with its Dutch door at the grade entrance and its wide west window is one of the pleasant spots in the house. This Buddy and Mary Ellen are using for their dining room. Adjoining it is the old milk room with its one-time brick floor, which has been made into a kitchen. Cupboards in natural wood finish line two sides of this long narrow room and a window at the north end looks out over the sloping lawns to the inlet and the lake beyond. With a bit of imagination the visitor can see on ledge big pans of milk waiting to be skimmed. Stepping directly from the kitchen into the cellar which makes up the remainder of this level, two feet thick foundation walls can be seen and the base of the exterior walls which are 18 inches through. All the original partitions in the house are masonry walls, some measuring six and others 12 inches thick. The Gaylords are furnishing the house in keeping with the period in which it was built. Some of the original wide plank floors have been restored and the doors have wrought iron latches, many of them the originals. Down the slope from the house towards the waters of the inlet, stands a two story cobblestone carriage house and on the bank of the creek, the remains of an old grist mill, which was operated for 100 years by a huge wooden water wheel polished smooth by the waters of Preston’s Creek pouring from the flume into the mill wheel basin. Giant locust, horse chestnut and maple tress, apparently also centenarians, cast protective shade about the house, the carriage house and the old mill. The creek, less boisterous now than it was in the early days when shallow draft Canadian boats docked at the old mill to load flour, still flows smoothly past the house to the lake. And thus old Preston house begins its second century with an air of pleased contentment at sheltering once again a descendant of that first John Preston.